Resigning from the company that you have contributed so much, is never easy. Composing a resignation letter is even harder. But one cannot run from what is inevitable no matter how much one hates to do it. One cannot call it an easy task to write a resignation letter without running out of the right things to say. But there are ways to make it seem easy for both the employee and the employer. The following points would help you leave out or include things that you want your employer to know when you are finally bidding adieu. Leaving your number in your resignation letter is a good way to see things through. It makes a lasting impression on your employer. Even though you are leaving it would feel good to know that people loved to have you around and look forward to see you again. By including your contact info in your resignation letter you not only give things a happy ending but also keep your doors open. Sometimes things do not turn out as you think they would, so you necessarily have to go back where you started off. So if the new position is keeping you up all night or putting too much on your plate, you should have the option to pick up where you left off. It has all to do with leaving a smile on your employers face. 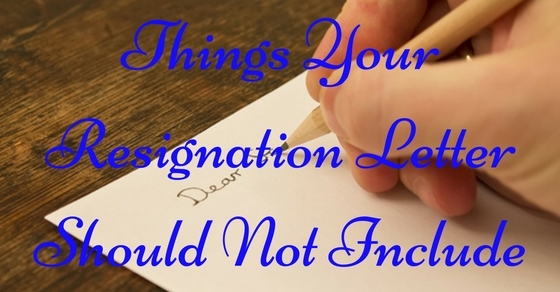 Do not talk about dissatisfaction in your resignation letter. Instead write something to appreciate the time you spent with the company. While it is true that you are leaving, you cannot forget that the company was the home that took you in, to give you a shot at life. Talk about how this experience was your platform to look forward to even greater things. Say that you are willing to work hard to achieve even more and your experience in the company will certainly help you reach your goal. 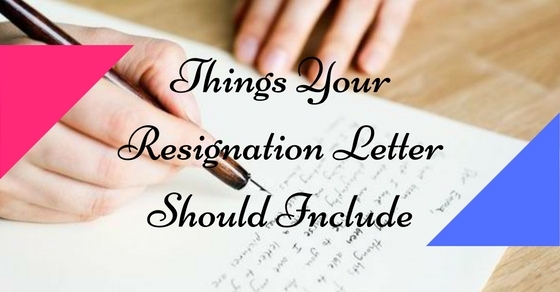 Do not hand in a resignation letter to your employer without notice simply because it is not polite. It is okay if you want to leave the company. But not letting your boss know beforehand is not only ignorant on your part but also disrespectful. The employers will not make light of your attitude. They may if they want to make it very difficult for you to get settled anywhere else. And there will not be much that you can do when your hands are tied. So make sure that you follow the rules and pay due respect to your seniors and the company by letting them know of your willingness to resign. Talk about the good things at work that would rather make you stay. Write about a few unforgettable moments of your life that you enjoyed as an employee. It can be anything and not only things that are just related to work. Include how you feel about your colleagues or whether you have had special moments with them. Talk about what you think the company has given you after spending years of faithful service. But try not to drag it out. There is a reason why you have ultimately decided to leave in spite of the eventful time you got to spend at the company. Mention who to contact where you would be working next in case there are problems with the transition on your departure. This can be tricky as dealing with such matters yourself can be very time consuming and may not even be your duty to take care of it. So always leave the matter to somebody whose job is to look into it. Sometimes there may be problems with clearances or official transaction that may eat up your valuable time if you do not know what to do with it. Therefore the best way to keep such problems at bay is to have somebody to deal with your affairs. Show interest in training the new replacement. Certainly your absence is going to leave a hole in the company. The least you can do to ease the problems is train a novice to grasp things faster. It would be so much better to leave on such a positive note. You would not only be helping a rookie stand on his/her feet but also show how much you care for the company. Moreover, being helpful yields its own advantages and perks. The company will not only remember you for your help but also think of you when they have work suited for experienced hands. Ending on a positive note is the most important thing to keep in mind. You do not want your emotions to run amok in your letter. Let go of grievance if you have any. It is not good to have a heavy heart when you are leaving a place you have been working at for a long time. You have to come to terms with your pent up emotions in a way that does not hurt anybody. Plus you do not want to have your name carved in the bad books of your previous employer for the rest of your life. Make sure that whatever you write makes things easy for all parties. It is possible that you most probably do not want to be a part of the company because something has offended you. But since you have decided to move its better you bury the hatchet. There is no point in complaining and making a fuss over things that went wrong for you. Do not make things any worse than it has to be. A wise person would bury all negative emotions deep inside him, just keep the options safe and wide open. Always speak highly of your colleagues. A small act of gratitude like that does a lot to see you through in the long run. Plus, you never know when you run into deep trouble and find yourself in dire need of help. It is at such dreadful times that a friend comes to the rescue. So make sure you are keeping that option open for yourself. And if you have made friends at work then they would expect the same from you. So make the most of friendship in every possible sense you can but also keep your end of the bargain. Prepare yourself to talk about your general experience at work. This is important because if you have not thought about what you are going to say, chances are that you may say something that will regret later. Make sure you are not writing anything that opposes the interests of the company. Just write it as if you are leaving a happy good-bye note without any regrets. Explain in brief why you have decided to move on from the company. Only write as much the employer needs to know and do not go out of line. Do not make negative remarks in your resignation letter that might create problems for the colleagues and the company. At the end you have decided to leave and the last thing you would do is leave a handful of problems for the people you spent years working with. Life does not always shape up as you want it to but that does not stop anybody from looking for what they want. And if you really want to move on to a new beginning then you have to stop holding grudges against the workplace. A problem is not the fault of any one party, it arises due to conflict. So be the better man and put the differences aside. Do not give a detailed description of your new position at a different organisation. Remember that you are leaving the place for good. Moreover talking too much about your new job will give rise to jealousy among your colleagues. It will also dishearten your employer to do any favors for you later. Lastly it is none of their business to learn about your official whereabouts when you no longer belong to them. The last thing you would have is a dozen former colleagues tailing you around out of jealousy and grief. Nobody has to know why you have decided to leave. It is an extremely personal decision and you are not entitled to tell anyone unless and until you wish to. And if you are given no choice but to write the reason specifically then you can write something very common if the real reason is too complicated or personal to share. It is unlikely that your colleagues would pry you for the reason but the employer may ask for an explanation. Keep it simple and do not write anything that will worry the employer about the reputation of the company. Do not show any feeling of despair or angst at anything that may have happened over time. Just remember that if your time at the company has been bad then it soon will be over. It is no use to be so hard driven by your get away letter. It is the ticket to leave the place once and for all. So farewell in peace. It is considered polite not to nit-pick when you have finally cut the cords. On the bright side, things seems much better when you start seeing the positive side of things. Have fun at the thought that you would not have to drag yourself to that place again. Do not make things worse than they already are. Some employees think that since you are no longer a part of their former company they can throw caution to the wind. This is the most stupid thing to do. If you think you can say anything you want to or abuse anybody you want to just because you have personal wars with them then think again. Being out of line and contemptuous of the company rules will not be taken lightly. The committee can very well start a disciplinary action against you if you are not careful about what you write. There is no reason for you to take out your vengeance like that. And if you have to nonetheless then use means that cannot be used against you. Making prank videos is not a good option either. Do not do anything that can be turned against you. And making videos where you talk disdainfully of the company is a great way to get yourself targeted. Just stick to the normal way of conducting the process. If you feel that you ought to let the company know what made you leave then discuss it with your employer behind closed doors keeping it strictly professional. Do not even for a second take things to heart as the end of the day nothing will change and you would still be heading for the door. Although it is never easy to leave work, sometimes it is just the necessary thing to do. There is no single or common way to do it because all of us who experience it know that reasons vary from one person to the other. However, the call is ultimately yours and the above points on what to say or not to are likely to make things seem simpler for you.